Ever ask someone to write down a local phone number, and later notice they didn’t include the area code? Or how about watching a weather alert that tells you about a tornado warning in xxxyyy county? If you travel all the time like we do, you have no idea what county you’re in, or what the area code is for local phone numbers. Now you do! All you need to do is tap the icon for an App called “Where Am I?” and all the information in the screenshot here will be displayed. 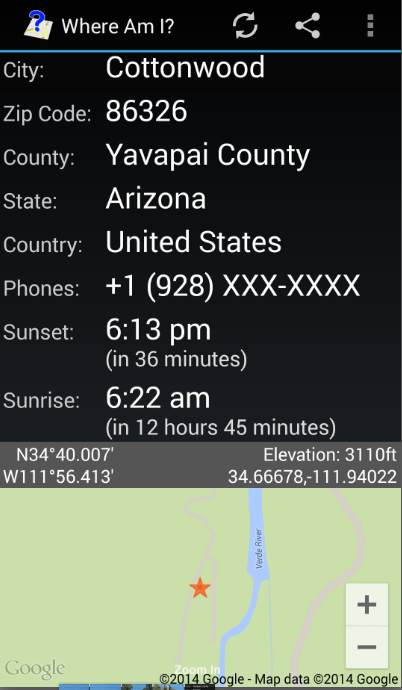 We use this all the time,mostly for the county name, zip code, and sunset/sunrise time. It’s so simple! Another feature that could come in very handy in an emergency, is the ability to tap on the share icon and send your location to a friend via email. If your friend opens it on their smartphone, they can tap on your location and Google Maps will navigate there! App Name: Where Am I?